This is a good project on Stepper Motor Control Using PIR Sensor which can be used for final year project by students of Electronics & Communication and Electrical Engineering. The project is mainly based on the Robotic technology. Mainly Robotic technology is used for more advanced applications. In this project, PIR sensor is used internally to Excellent performance infrared sensor for use in alarm burglar systems, visitor presence monitoring, light switches and robots. In robotics, stepper motors are widely used. They offer amazing precision as well as continuous rotation. You can also Subscribe to FINAL YEAR PROJECT'S by Email for more such Projects and Seminar. 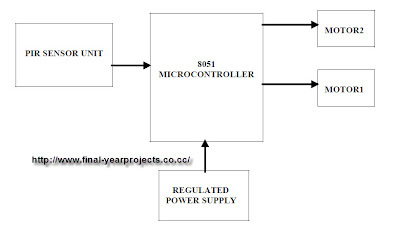 The above image shows the block diagram of Stepper Motor Control Using PIR Sensor which consist of Microcontroller, PIR Sensor, Stepper motor and regulated power supply. 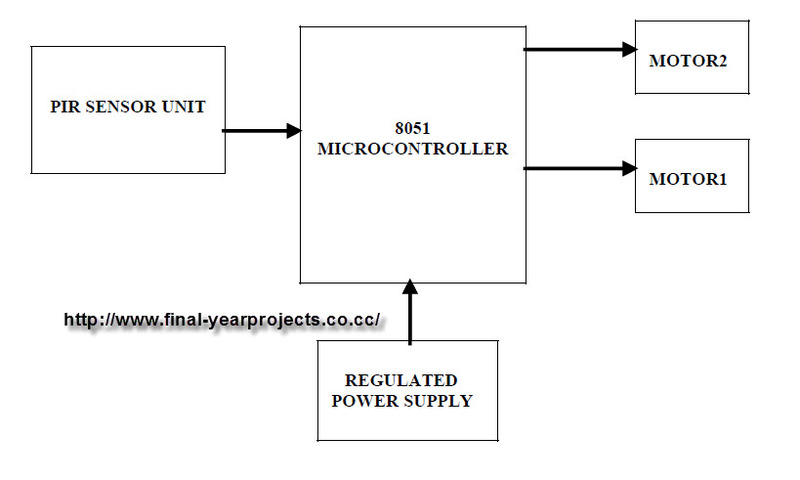 The report contains the microcontroller source programming code and circuit diagram. Use this report for your reference and study purpose only.